These JARLIF Women’s Fashion sneakers are sporty and cute, with attractive styling and a comfortable fit. The variety of colors and reasonable price mean that you could get different pairs for every outfit and occasion, and enjoy comfort and style every day of the week. The cushioned sole and mesh upper promise breathable comfort hour after hour. While the attractive colors and knit upper are stylish, these shoes also promise comfort and ease while walking, running errands, a day at work, or just in the house. But do they deliver the lasting comfort they look like they will? And are they durable enough to be a good value for the money? We’re taking a closer look at these women’s fashion tennis shoes to see if they are a good investment, and live up to the promise of their look. The lightweight construction means they aren’t durable for sports or athletic activities. The Jarlif Women’s Breathable Fashion Shoes are perfect for everyday casual wear and light activities. The cushioned sole adds height and protection from impact, and the attractive styling and range of colors makes them a cute choice in a variety of settings. Reviewers say these shoes fit well and are true to size. They are comfortable, making them ideal for light walking, running errands, or just casual daily wear. The slightly elevated heel adds height, enhancing the fashionable appeal of these shoes. These are not durable, high-impact shoes for athletic activities, or for extended walking or running. The lack of support inside means that there may be some discomfort after hours on your feet, and the low rise makes them less suitable for inserts or orthotics for additional support. The low rise in the heel also provides less grip for athletic activities where the heel needs additional support or stability. Women who need arch support will struggle with these shoes, because they don’t have any support inside the shoe, and the low rise leaves little room for after-market orthotics or inserts. Women who want arch support in an all-day shoe may find these uncomfortable after extended wear, and may want to consider a different shoe. They come with an attractive plastic carrying bag that travelers will find convenient for packing these shoes inside their luggage. The low odor breathable mesh upper is also travel friendly, since the shoes will stay dry and not emit odor when packed. The breathable mesh upper is great for reducing odor and moisture, but may be a problem in cold or wet weather. These shoes will probably not be right for harsh weather conditions. These shoes add about an inch of height, adding to their appeal as a fashion shoe. The variety of colors and reasonable price mean that you could get multiple pairs for multiple outfits, and have sporty comfort for a variety of activities. Due to the lack of serious tread on the sole, support in the ankle, or lateral support in the shoe, they are probably not ideal for hiking or athletic activities, although the air cushioning may help with light jogging or simply a normal day on your feet. Compared to other women’s casual shoes, these are comfortable and lightweight, perfect for casual athletic fashion when out and about. For extended, high-impact wear on the feet, these shoes are probably not a good choice, due to the lack of supportive cushioning inside, and a less durable sole on the outside. These shoes aren’t good for running or athletic activities. They also have less arch support than shoes that are specifically designed for running or athletic activities, and some women complain that long periods of wearing these shoes causes foot pain due to lack of internal support for the arch. These shoes are a great way to sport the fashionable knit look in the upper without spending a fortune on athletic shoes when they aren’t needed. Due to their light weight and cushioned sole, these shoes would also be good for travel, if your destination involves a lot of walking without strenuous hiking. The Jarlif Women’s Breathable Fashion Shoes are excellent for cute, sporty style, but lacking in enduring sports performance. They are best for casual days, light walking, running errands, or just wearing around the house in comfort and style. The added heel height is a feature many women will enjoy for the style and impact on their look, particularly because it doesn’t sacrifice comfort or function in these shoes. Women who need more durability, support, and performance in a running or athletic shoe will probably prefer a different brand. These aren’t designed for tennis or for high-impact activities, and will not provide the necessary support, durability, or protection. 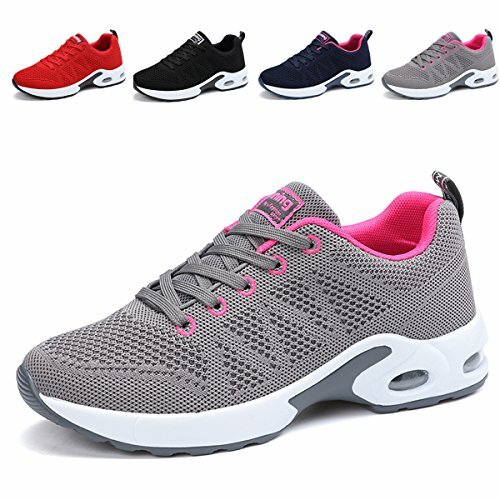 Overall, these shoes should be valued for their cute appearance and reasonable price, and women who want a casual sporty look will be happy with the comfort and color range of these shoes. The low purchase price and money back guarantee make it easy to try them out and see if they are right for you.